Pete is a perfectly predictable, practical, uncomplicated pig. At least, he was . . . before a runaway circus elephant named Pickles stampeded into his life, needing a friend. Pickles is larger than life and overflowing with imagination. She takes Pete swandiving off Niagara Falls. (Sort of.) And sledding down the Matterhorn. (Sort of.) Pete goes along for the wild ride and actually begins to enjoy himself . . . until Pickles goes too far. And Pete tells her she must leave. Yet sometimes the simple life isn?t all it?s cracked up to be. Pulitzer Prize?winning cartoonist Berkeley Breathed offers two new irresistible characters and a heartfelt, hilarious look at the rarity of true friendship. Berkeley Breathed (www.berkeleybreathed.com) is the Pulitzer Prize-winning creator of the renowned comic strips "Bloom County," "Outland," and "Opus" which have appeared in over 1,200 newspapers worldwide and have earned Berkeley millions of loyal fans. He recently decided to bring back "Bloom County" after a 25-year absence and has been overwhelmed by the response--and by how much fun he is having. 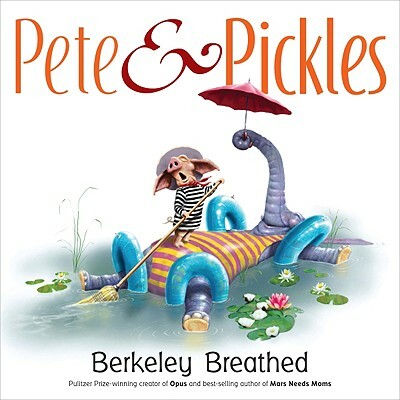 Berkeley Breathed is also the creator of the illustrated novel Flawed Dogs and the New York Times bestselling picture books Mars Needs Moms! andPete & Pickles. He lives and works in Santa Barbara, California.